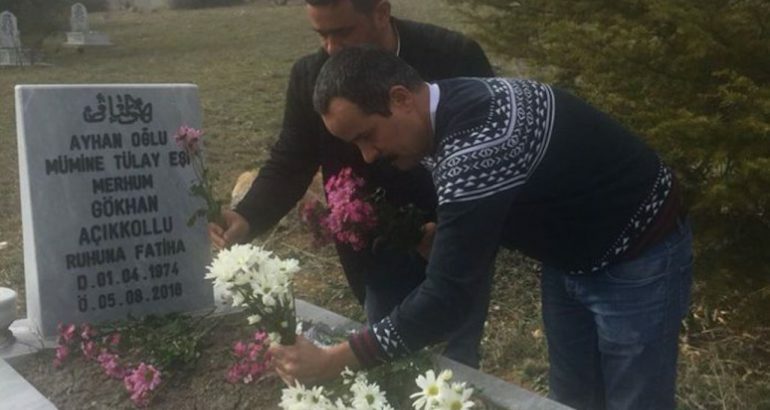 Veli Saçılık, a sociologist and leftist activist, has visited the grave of Gökhan Açıkkollu, a teacher who was tortured to death while in police custody in the wake of a controversial coup attempt in Turkey on July 15, 2016 over alleged membership in the faith-based Gülen movement. Saçılık, who lost his right arm in a military operation known as “Operation Return to Life” conducted in December 2000 in 20 prisons across Turkey, is a renowned figure in Turkey who has been detained many times by the police for taking part in demonstrations on behalf of individuals who were removed from their posts by the government after the coup attempt. Teacher Açıkkollu was detained on July 24, 2016 on trumped-up charges of coup plotting and terrorism and remained in police custody for 13 days, during which time he was subjected to both physical and psychological torture and eventually died. Saçılık visited Açıkkollu’s grave in the Central Anatolian province of Konya on Saturday and delivered a short speech there, which he later posted on his Twitter account. Last week, Açıkkollu was “reinstated” to his job at a public school in İstanbul one-and-a-half years after his death. The activist said he was paying a visit to Açıkkollu’s grave to bid him farewell. “He [Açıkkollu] has been reinstated to his job, but he was massacred under detention. As a person who lost one of his arms in prison, I have experienced a lot of pain in this country, and perhaps when I lost my arm, Gökhan thought a terrorist had lost his arm, but when we lend an ear to each other’s pain and say nobody should be subjected to torture and when we dream of a humane life, everything will be different. At that time, we will not embrace a gravestone but each other. This is the important thing,” Saçılık said as he laid a bouquet of flowers at the teacher’s grave. Açıkkollu’s family learned of his death when they were called to the İstanbul Institute of Forensic Medicine, where Açıkkollu’s ill treatment continued even in death. They were told the funeral could be held on condition that he be buried in a graveyard set aside by the Greater İstanbul Municipality for alleged “traitors,” despite the fact he had not been tried, nor even interrogated. Imams assigned by the Religious Affairs Directorate (Diyanet) had refused to say the funeral prayer for Açıkkollu.